Weather: 70 at start, upper no wind. 2.99 7:26 Kicked it at the end. 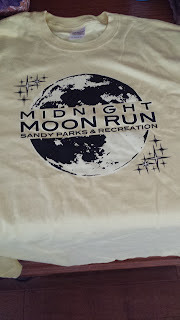 One of my summer traditions is to do the Sandy City Midnight Moon 5K. Sandy puts on an affordable, no frills race. I missed it last year on account I was doing a half marathon (or I was out of town, I forget which). But this year, when I saw it appear on the race calendar, I knew I had to run it. I arrived at the race at about 11:15 PM and killed some time before doing a 2 mile warm up. On my warm-up I realized I had to go to the bathroom -- not the kind you can easily take care of in the bushes. I found the bathroom with about 10 minutes to spare only to realize it only had 1 stall and 4 people were ahead of me waiting for the stall. Ugh. Let's just say I went to the bathroom super fast and managed to get to the starting line with about 2 minutes to spare. The course starts off with gentle incline that after half a mile turns into a hill climb. I had done my warm up on the first mile so I was mentally prepared for the first mile. My goal was to go out fairly conservatively and hammer the final two miles. I haven't done many 5Ks recently and have done very little speed work, so I suspected my time was going to be slower than usual. The course winds its way around a residential neighborhood that has some nice houses. Also, the starting line is at 4700 feet and climbs to about 4800 or so. So the air is a bit thinner. At the starting line, I ran into a friend of mine who I met at one of the first races I had ever done in Utah. We exchanged hellos and then go serious. My friend (DK) beat me at last year's Draper 5K so I figured if I could hang with him I'd be in decent shape. I wound up dogging DK for about half the race. Once the downhills started, I was able to turn on the jets and put some distance between him. I had my eyes set on another guy that might've been in my age group, but unfortunately, I ran out of real-estate before catching him. I was really hurting by the time I got to mile 2. My legs felt like rubber as there was a brief up hill section. I focused and realized I had only one more mile, so I just held on. This morning, studying my split, I was really impressed with my final mile. I felt like the race was over incredibly soon. 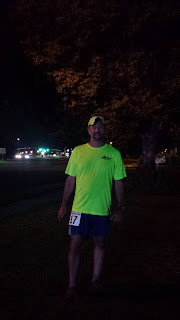 I haven't raced many 5Ks recently and stopping after less than 25 minutes of running felt easy. The pain level, however, of a 5K is definitely different than a marathon (or even a half). To say that I was disappointed with my placement in the men's 45 - 49 would be an understatement. In the past, my age group has been lightly attended, as this race tends to attract younger folks (after all, it is a midnight start). However, I did beat my estimate -- I had planned to finish around 24:30. I did win a toy baseball bat / ball, which I gave to my friend DK for his grandchildren. They had water, bananas, granola bars, and candy fruits for snacks. I wound up socializing a bit and ran into another runner that I had run with during the Legacy Half Marathon. He had beaten me at that race but I wound up taking him in this one. Granted, he is probably 20 years my senior though. Always great to see seniors running competitively. 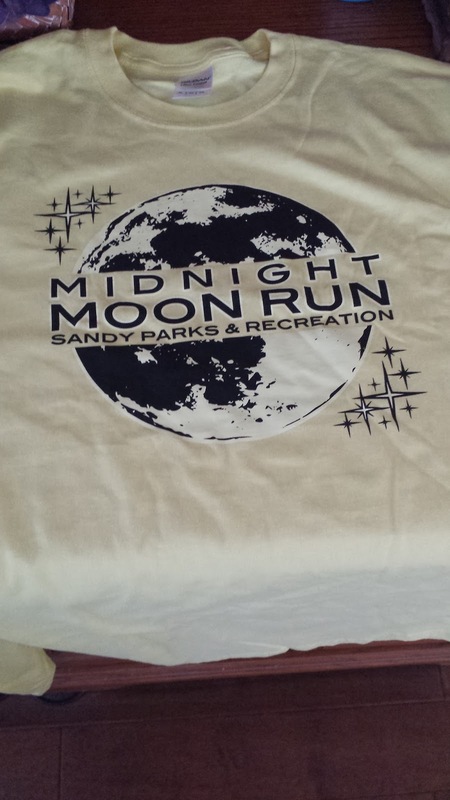 This race is a steal -- $22 for a t-shirt, a tote bag, and a supported race. The course was well marked and while there was some traffic, it was residential and properly handled. Also, if you were an age group winner, you could simply show your results card and pick up your award and go home. 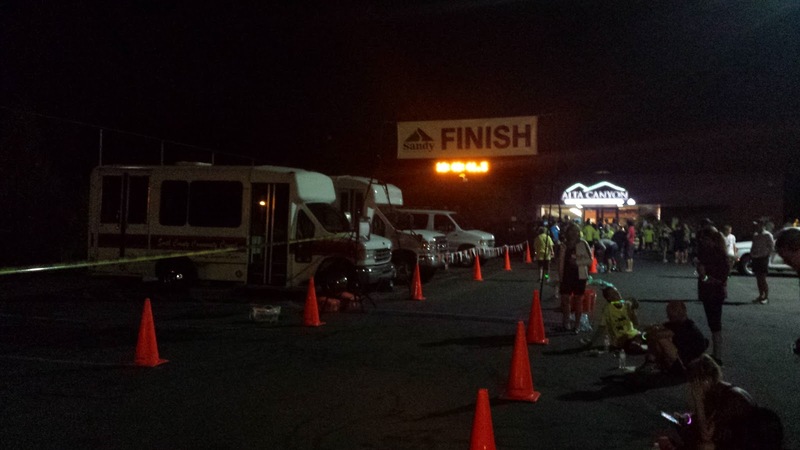 The race started at midnight and I was home and showering by 1 AM. The shirt is cotton, so it will likely be relegated to night-wear or given away. Not a manly color, but for $22 I didn't expect a tech shirt. The course may be short, but there are some turns that the Garmin may not be able to take into account. Two years ago, my Garmin registered the race at 3.05 miles. MapMyRun.com shows the race at about 3.10. I definitely have some work to do in order to get my speed back.